Recently, we featured a story on the remarkable life of Peter Cameron Scott, founder of Africa Inland Mission, International (AIM). We thought we’d give you the opportunity to read more about this ministry, its history, and feature links to other information about AIM. 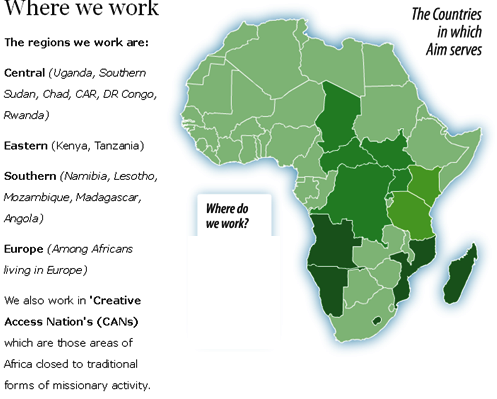 Africa Inland Mission has over 930 people working in over 20 countries in Africa, all sharing the same goal of reaching out to those who have never heard the gospel. To date, over four million people worship in churches founded through the work of AIM and that work continues. However, we have a heart for African people, and that’s why our work isn’t restricted to the African continent but includes reaching Africans in the UK and Europe as well. Serving across Africa, and ministering to Africans living in Europe, we work in partnership with the African church to reach Africa’s unreached peoples with the Good News of Jesus Christ. This entry was posted in GUEST POSTS, HEROES OF THE FAITH, HISTORY CHANNELS, MINISTRIES WE SUPPORT, PRAY FOR THE PERSECUTED and tagged AIM, Christian history, heroes of the faith, ministries we support.. Bookmark the permalink.